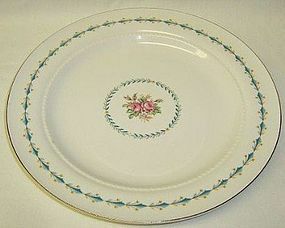 This really pretty Dresden Duchess 7 Inch Salad Plate was made by Harker China. This Plate is in very good condition with no chips, cracks or scratches. The decoration and gold trim is all very good. There is some crazing in the glaze indicative to the old china. It does not take away from the beauty of this piece. Be sure to search our other Harker available We guarantee all items to be as described. Feel free to email with any questions. THANK YOU. This really pretty Dresden Duchess 8 1/8 Inch Pie Server was made by Harker China. This Pie Server is in very good condition with no chips, cracks or scratches. The decoration and gold trim is all very good. There is some crazing in the glaze indicative to the old china. It does not take away from the beauty of this piece. Be sure to search our other Harker available. We guarantee all items to be as described. Feel free to email with any questions. THANK YOU. This really pretty Dresden Duchess 8 3/8 Inch Serving Spoon was made by Harker China. This Spoon is in very good condition with no chips, cracks or scratches. The decoration and gold trim is all very good. There is some crazing in the glaze indicative to the old china. It does not take away from the beauty of this piece. Be sure to search our other Harker available. We guarantee all items to be as described. Feel free to email with any questions. THANK YOU. This really pretty China 8 1/4 inch Serving Spoon with gold trim on the handle and gold decoration in the spoon bowl, we believe was made by Harker. This Spoon is in really good condition with no chips or cracks. There is some slight crazing in the china from age. Be sure to search our other china serving pieces available. We guarantee all items to be as described. Feel free to email with any questions. THANK YOU. This really pretty China 9 1/4 inch Pie Server in the Pine decoration, we believe was made by Harker. This Pie Server is in really good condition with no chips or cracks. There is some slight crazing in the china from age. Be sure to search our other china serving pieces available. We guarantee all items to be as described. Feel free to email with any questions. THANK YOU. This really pretty China 9 1/4 inch Pie Server with a Pink Floral decoration and gold trim on the serving end and handle, we believe was made by Harker. This Pie Server is in really good condition with no chips or cracks. There is some slight crazing in the china from age. Be sure to search our other china serving pieces available. We guarantee all items to be as described. Feel free to email with any questions. THANK YOU. This is a really nice black Fiesta Tom and Jerry Mug made by Homer Laughlin. 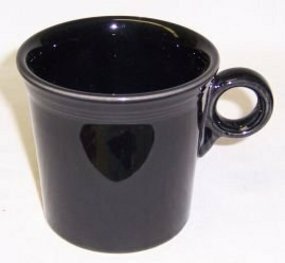 This Mug measures 3 1/2 Inches high X 3 5/8 Inches in diameter. It is in excellent, unused, condition with no chips, cracks or scratches. It is signed HLC Fiesta USA. Be sure to search our other Homer Laughlin available. We guarantee all items to be as described. Feel free to email with any questions. THANK YOU. This is a really nice black Fiesta 8 3/4 inch Flanged Soup Bowl made by Homer Laughlin. This Bowl measures 1 1/2 inches high and is in excellent, unused, condition with no chips, cracks or scratches. It is not signed. Be sure to search our other Homer Laughlin available. We guarantee all items to be as described. Feel free to email with any questions. THANK YOU. 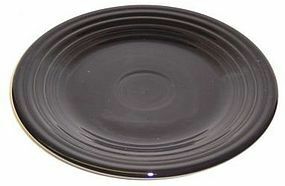 This is a really nice black Fiesta 9 inch diameter Luncheon Plate made by Homer Laughlin. This Plate is in excellent, unused, condition with no chips, cracks or scratches. It is not signed. Be sure to search our other Homer Laughlin available. We guarantee all items to be as described. Feel free to email with any questions. THANK YOU. 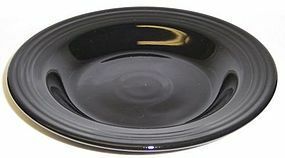 This is a really nice black Fiesta 5 1/4 inch diameter Fruit or Sauce Bowl made by Homer Laughlin. This Bowl measures 1 1/4 inches high and is in excellent, unused, condition with no chips, cracks or scratches. It is signed FIESTA on the bottom. Be sure to search our other Homer Laughlin available. We guarantee all items to be as described. Feel free to email with any questions. THANK YOU. 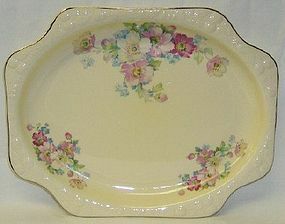 This really nice Mount Vernon Oval Serving Platter was made by Hall China. This Platter measures 13 1/2 inches long X 10 inches across. It is in very good condition with no chips, cracks or scratches. The Mount Vernon decoration and gold trim is all very good. 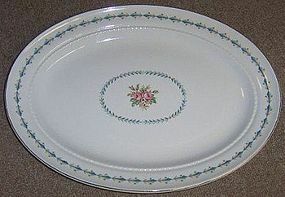 This Platter is stamped on the back FINE DINNERWARE Harmony House Mount Vernon MADE IN U.S.A. by Hall China. We guarantee all items to be as described. Feel free to email with any questions. THANK YOU. 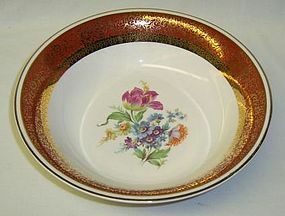 This really nice Mount Vernon Oval Serving Bowl was made by Hall China. This Bowl measures 9 3/8 inches long X 6 1/2 inches across. It is in very good condition with no chips, cracks or scratches. The Mount Vernon decoration and gold trim is all very good. 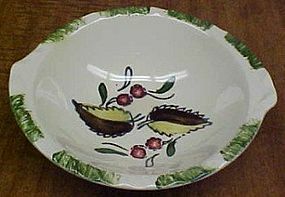 This Bowl is stamped on the back FINE DINNERWARE Harmony House Mount Vernon MADE IN U.S.A. by Hall China. We guarantee all items to be as described. Feel free to email with any questions. THANK YOU. 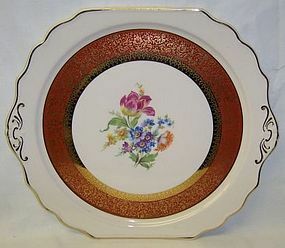 This really nice Mount Vernon 10 inch Dinner Plate was made by Hall China. This Plate is in very good condition with no chips or cracks. There are a couple very light surface scratches on the plate. The Mount Vernon decoration and gold trim is all very good. 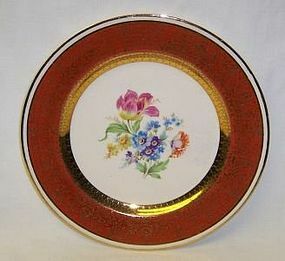 This Plate is stamped on the back FINE DINNERWARE Harmony House Mount Vernon MADE IN U.S.A. by Hall China. We guarantee all items to be as described. Feel free to email with any questions. THANK YOU.